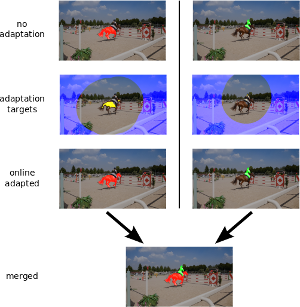 Many of the recent successful methods for video object segmentation (VOS) are overly complicated, heavily rely on fine-tuning on the first frame, and/or are slow, and are hence of limited practical use. In this work, we propose FEELVOS as a simple and fast method which does not rely on fine-tuning. In order to segment a video, for each frame FEELVOS uses a semantic pixel-wise embedding together with a global and a local matching mechanism to transfer information from the first frame and from the previous frame of the video to the current frame. In contrast to previous work, our embedding is only used as an internal guidance of a convolutional network. Our novel dynamic segmentation head allows us to train the network, including the embedding, end-to-end for the multiple object segmentation task with a cross entropy loss. We achieve a new state of the art in video object segmentation without fine-tuning with a J&F measure of 71.5% on the DAVIS 2017 validation set. We make our code and models available at https://github.com/tensorflow/models/tree/master/research/feelvos. 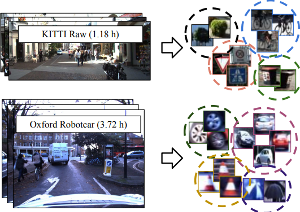 This paper addresses the problem of object discovery from unlabeled driving videos captured in a realistic automotive setting. Identifying recurring object categories in such raw video streams is a very challenging problem. Not only do object candidates first have to be localized in the input images, but many interesting object categories occur relatively infrequently. Object discovery will therefore have to deal with the difficulties of operating in the long tail of the object distribution. We demonstrate the feasibility of performing fully automatic object discovery in such a setting by mining object tracks using a generic object tracker. In order to facilitate further research in object discovery, we will release a collection of more than 360'000 automatically mined object tracks from 10+ hours of video data (560'000 frames). We use this dataset to evaluate the suitability of different feature representations and clustering strategies for object discovery. We approach video object segmentation (VOS) by splitting the task into two sub-tasks: bounding box level tracking, followed by bounding box segmentation. 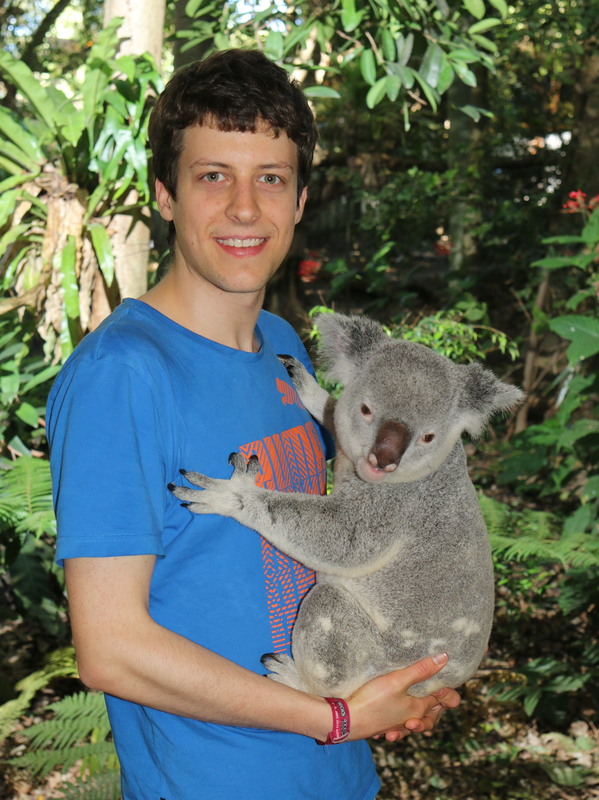 Following this paradigm, we present BoLTVOS (Box Level Tracking for VOS), which consists of an R-CNN detector conditioned on the first-frame bounding box to detect the object of interest, a temporal consistency rescoring algorithm, and a Box2Seg network that converts bounding boxes to segmentation masks. BoLTVOS performs VOS using only the first-frame bounding box without the mask. We evaluate our approach on DAVIS 2017 and YouTube-VOS, and show that it outperforms all methods that do not perform first-frame fine-tuning. We further present BoLTVOS-ft, which learns to segment the object in question using the first-frame mask while it is being tracked, without increasing the runtime. BoLTVOS-ft outperforms PReMVOS, the previously best performing VOS method on DAVIS 2016 and YouTube-VOS, while running up to 45 times faster. Our bounding box tracker also outperforms all previous short-term and longterm trackers on the bounding box level tracking datasets OTB 2015 and LTB35. 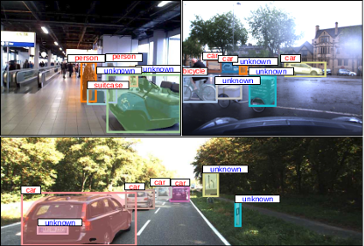 The most common paradigm for vision-based multi-object tracking is tracking-by-detection, due to the availability of reliable detectors for several important object categories such as cars and pedestrians. However, future mobile systems will need a capability to cope with rich human-made environments, in which obtaining detectors for every possible object category would be infeasible. 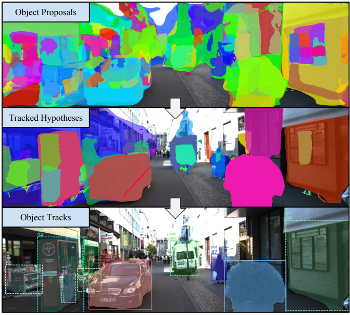 In this paper, we propose a model-free multi-object tracking approach that uses a category-agnostic image segmentation method to track objects. We present an efficient segmentation mask-based tracker which associates pixel-precise masks reported by the segmentation. Our approach can utilize semantic information whenever it is available for classifying objects at the track level, while retaining the capability to track generic unknown objects in the absence of such information. We demonstrate experimentally that our approach achieves performance comparable to state-of-the-art tracking-by-detection methods for popular object categories such as cars and pedestrians. Additionally, we show that the proposed method can discover and robustly track a large variety of other objects. 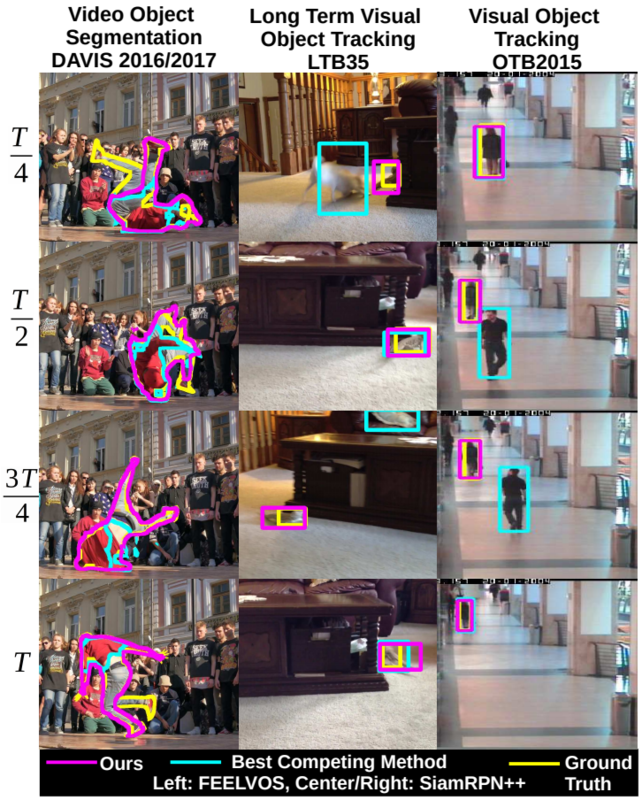 We address semi-supervised video object segmentation, the task of automatically generating accurate and consistent pixel masks for objects in a video sequence, given the first-frame ground truth annotations. Towards this goal, we present the PReMVOS algorithm (Proposal-generation, Refinement and Merging for Video Object Segmentation). This method involves generating coarse object proposals using a Mask R-CNN like object detector, followed by a refinement network that produces accurate pixel masks for each proposal. We then select and link these proposals over time using a merging algorithm that takes into account an objectness score, the optical flow warping, and a Re-ID feature embedding vector for each proposal. We adapt our networks to the target video domain by fine-tuning on a large set of augmented images generated from the first-frame ground truth. Our approach surpasses all previous state-of-the-art results on the DAVIS 2017 video object segmentation benchmark and achieves first place in the DAVIS 2018 Video Object Segmentation Challenge with a mean of J & F score of 74.7. We evaluate our PReMVOS algorithm 2 on the new YouTube-VOS dataset  for the task of semi-supervised video object segmentation (VOS). This task consists of automatically generating accurate and consistent pixel masks for multiple objects in a video sequence, given the object’s first-frame ground truth annotations. The new YouTube-VOS dataset and the corresponding challenge, the 1st Large-scale Video Object Segmentation Challenge, provide a much larger scale evaluation than any previous VOS benchmarks. Our method achieves the best results in the 2018 Large-scale Video Object Segmentation Challenge with a J &F overall mean score over both known and unknown categories of 72.2. We propose to leverage a generic object tracker in order to perform object mining in large-scale unlabeled videos, captured in a realistic automotive setting. We present a dataset of more than 360'000 automatically mined object tracks from 10+ hours of video data (560'000 frames) and propose a method for automated novel category discovery and detector learning. In addition, we show preliminary results on using the mined tracks for object detector adaptation. This paper describes our method used for the 2017 DAVIS Challenge on Video Object Segmentation . The challenge’s task is to segment the pixels belonging to multiple objects in a video using the ground truth pixel masks, which are given for the first frame. We build on our recently proposed Online Adaptive Video Object Segmentation (OnAVOS) method which pretrains a convolutional neural network for objectness, fine-tunes it on the first frame, and further updates the network online while processing the video. OnAVOS selects confidently predicted foreground pixels as positive training examples and pixels, which are far away from the last assumed object position as negative examples. While OnAVOS was designed to work with a single object, we extend it to handle multiple objects by combining the predictions of multiple single-object runs. We introduce further extensions including upsampling layers which increase the output resolution. We achieved the fifth place out of 22 submissions to the competition. In this work we release our extensible and easily configurable neural network training software. It provides a rich set of functional layers with a particular focus on efficient training of recurrent neural network topologies on multiple GPUs. The source of the software package is public and freely available for academic research purposes and can be used as a framework or as a standalone tool which supports a flexible configuration. The software allows to train state-of-the-art deep bidirectional long short-term memory (LSTM) models on both one dimensional data like speech or two dimensional data like handwritten text and was used to develop successful submission systems in several evaluation campaigns. Recent experiments show that deep bidirectional long short-term memory (BLSTM) recurrent neural network acoustic models outperform feedforward neural networks for automatic speech recognition (ASR). However, their training requires a lot of tuning and experience. In this work, we provide a comprehensive overview over various BLSTM training aspects and their interplay within ASR, which has been missing so far in the literature. We investigate on different variants of optimization methods, batching, truncated backpropagation, and regularization techniques such as dropout, and we study the effect of size and depth, training models of up to 10 layers. This includes a comparison of computation times vs. recognition performance. Furthermore, we introduce a pretraining scheme for LSTMs with layer-wise construction of the network showing good improvements especially for deep networks. The experimental analysis mainly was performed on the Quaero task, with additional results on Switchboard. The best BLSTM model gave a relative improvement in word error rate of over 15% compared to our best feed-forward baseline on our Quaero 50h task. All experiments were done using RETURNN and RASR, RWTH’s extensible training framework for universal recurrent neural networks and ASR toolkit. The training configuration files are publicly available. Multidimensional long short-term memory recurrent neural networks achieve impressive results for handwriting recognition. However, with current CPU-based implementations, their training is very expensive and thus their capacity has so far been limited. We release an efficient GPU-based implementation which greatly reduces training times by processing the input in a diagonal-wise fashion. We use this implementation to explore deeper and wider architectures than previously used for handwriting recognition and show that especially the depth plays an important role. We outperform state of the art results on two databases with a deep multidimensional network. We investigate sequence-discriminative training of long short-term memory recurrent neural networks using the maximum mutual information criterion. We show that although recurrent neural networks already make use of the whole observation sequence and are able to incorporate more contextual information than feed forward networks, their performance can be improved with sequence-discriminative training. Experiments are performed on two publicly available handwriting recognition tasks containing English and French handwriting. On the English corpus, we obtain a relative improvement in WER of over 11% with maximum mutual information (MMI) training compared to cross-entropy training. On the French corpus, we observed that it is necessary to interpolate the MMI objective function with cross-entropy.